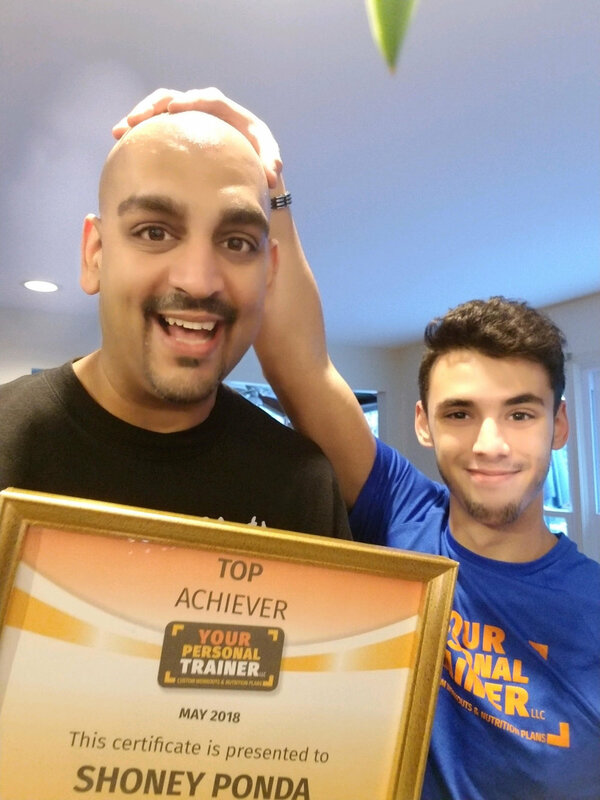 I’d like to present the first ever Top Achiever of the Month award to Shoney Ponda for his Exceptional Weight Loss! Shoney is a loving husband, a father of 2 smart and sassy little girls, and the owner of an Exxon gas station on Rockville Pike and Nicholson Lane. Shoney started his health journey in July 2017, where he decided to improve his eating and adopted a plant-based vegan diet. He lost 30 pounds in just a few months! I met Shoney in October at Potomac Day in Rockville, where we briefly chatted about his goals and how exercise would be a great addition to his weight-loss. He had never worked out, but told me he was extremely coachable. Little did we know what transformation was ahead! Since starting our workouts together, Shoney has lost 22 pounds of fat, has gained more than 8 pounds of muscle, has better health measures than he did when he was 18 years old, and has experienced some other benefits of exercise, including increased creativity and clear-headedness. Along with exercise, Shoney is taking classes, seminars, workshops, and is always looking for ways to improve himself and the world around him. I wake up at 5am actually excited to get to his house (I’m a night owl so that’s a big deal for me) because Shoney is hilarious; I know I’m gonna be cracking up laughing! Shoney is extremely thoughtful, and from our conversations I’ve learned a lot about what true compassion and empathy looks like. He’s a big guy and can seem intimidating at first, but once you get to know him, he’s just a big teddy-bear who loves to laugh and would do anything for his family. Congratulations on your award Buddy, you deserve it!